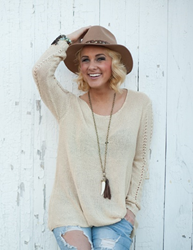 Rising Country artist Adley Stump has been named one of the winners of the 2016 Hyundai and The Recording Academy® fourth annual GRAMMY Amplifier® program. She was one of 3 winners chosen from over 4000 entrants. Adley will be one of the featured performers at a GRAMMY Amplifier® showcase at the SXSW Music festival in Austin, Texas on March 18th. Ms. Stump says “What an immeasurable honor! I am so thankful to the Grammy’s for front-running this initiative to recognize and foster independent talent. I couldn’t be more humbled to have been acknowledged; there is no better organization I could have wished to learn from and grow not only as an artist, but as a person & a member of the creative community I love so much”. The fourth annual GRAMMY Amplifier program launched last November when program hopefuls were asked to upload their song on the GRAMMY Amplifier website and drive friends, family and fans to listen and "amplify" their track. Based on total track plays and social media "amplifications," a top 25 list of semifinalists were selected after which point accumulations for the semifinalist group continued. A group of 10 finalists were selected and submitted to the GRAMMY Amplifier curators who then chose the winners. All the finalists were given the opportunity to fly to Los Angeles where they participated in a Music Business Immersion Day with the goal of educating them on social media promotion, copyrights, and publishing, among other topics. 2015 was a break-out year for Adley: Her EP “Like This” (Deluxe) was named “New and Noteworthy” by iTunes and she appeared on several TV shows in support of the release, including being the Featured Music performer at the Miss USA telecast. Her single & video “Stay At Home Soldier” drew accolades across the board and was featured on 115 iHeartmedia Country station websites, Syndicated “Taste Of Country Nights” radio show and Slacker’s “Weekly Country Countdown”; she performed live in front of more than 100,000 fans throughout the year, including the CMA Fan Fair in Nashville. Adley became a #1 Best Selling Author through Amazon.com with her collaboration titled: “How They Sell Music: Lessons from Celebrities on Creating Your Own Success”. Ms. Stump has been busy so far in 2016: She is currently in pre-production for a new EP – the first single/video will be released in early April, with the EP release to follow in late May in time for the summer touring season. She has already been booked on big Country Music Festivals for 2016: Tree Town Festival in Forest City, Iowa May 26 – 29; Taste Of Country Music Festival in Hunter, New York on June 12th, Country Fest in Cadott, Wi on June 17th and Country Jam in Mack, Colorado June 18th & 19th. An extensive national tour is being booked and additional dates will be announced in early April.